Test your recycling and composting know-how. Which of these statements are true? Which ones are urban legend? 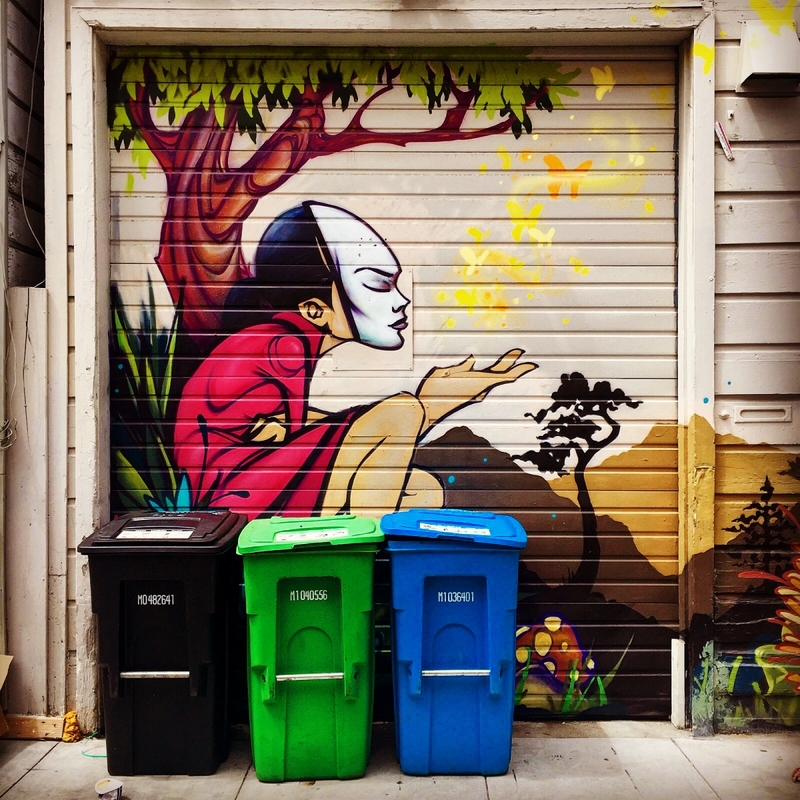 Help San Francisco strive for zero waste by busting some recycling myths! Recology will sort the black bin for me. The recycling and trash gets mixed when dumped into the same collection truck. Coffee cups go in the recycling bin. Recycling and composting is mandatory in San Francisco. Putting food scraps in the trash is fine since it will break down anyways. I can get a free compost pail if I live in San Francisco. It’s too complicated to sort and my roommates throw everything in the trash anyways. Worn out clothes with holes and stains have to go in the trash. Plastic has to be perfectly clean before being recycled. San Francisco’s compost is used on vineyards in Napa and Sonoma. I can only recycle something if it has a recycling symbol or number. Recycling doesn’t make a difference. The Giants continue to lead the industry with their greening efforts and programs. Recology will sort the black bin for me. Busted! The black landfill bin does not get sorted by someone else – this is actually our responsibility as residents or businesses in San Francisco. Everything you put in the black bin is taken to “the pit” (Recology’s transfer station), and then driven to the landfill. The recycling and trash gets mixed when dumped into the same collection truck. Busted! Recology has separate compartments in the side loading trucks and the driver controls whether to send it to the recycling or landfill side of the truck. The material is not mixed. Coffee cups go in the recycling bin. True! Empty paper coffee cups go in the blue recycling bin as well as the plastic lid and paper sleeve. You won’t have this sorting dilemma if you just bring your own reusable mug. Many coffee shops offer a discount to customers who bring their own mug. It’s also the #SFThingtoDo. Recycling and composting is mandatory in San Francisco. True! Putting food scraps in the trash is fine since it will break down anyways. Busted! When you put food scraps (like banana peels and meat bones) in the landfill, they break down without oxygen (anaerobically) and produce methane, a potent greenhouse gas and major contributor to climate change. I can get a free compost pail if I live in San Francisco. True! All San Francisco residents can request a kitchen compost pail from Recology. It’s too complicated to sort and my roommates throw everything in the trash anyways. Busted! Sorting is easy and can be fun, especially if you’re the type that likes to match your socks or tell your roommates what to do. Make it easy for your roommates and guests with a sassy customized message using the zero waste signmaker tool. You can also geek out late nights by finding out how to recycle mannequins, records, or whatever item you have in the back of your closet (www.recyclewhere.org). Plus, recycling and composting is mandatory for all residents and businesses in San Francisco. Worn out clothes with holes and stains have to go in the trash. Busted! Clean clothes with holes and stains can be recycled in your curbside bins. Visit SFRecycles.org for details. Collect fabric, rags, and scrap cloth in a clear plastic bag, and place in your blue recycling bin. Take clothes in good condition, as well as shoes and accessories (like belts, purses, and backpacks), to a reuse center near you. Plastic has to be perfectly clean before being recycled. Busted! We like to say, “when in drought, get the majority of food out.” Meaning, don’t worry about rinsing those plastic tubs perfectly clean with a lot of water. The best way to remove food remnants from your plastic peanut butter jars or yogurt containers is by using a spatula to scrape out the food into your compost bin. That way you can save your delicious Hetch Hetchy tap water for your drinking needs and still keep your recycling game top notch. San Francisco’s compost is used on vineyards in Napa and Sonoma. True! San Francisco’s food scraps are sent to a facility near Vacaville and turned into valuable compost. Some of the finished compost is sold and spread on vineyards to help grow these wine grapes. That is why it is so important to only put compostable items in the green bin as glass and plastics can contaminate the compost. So next time you have a glass of wine, give a toast to compost! I can only recycle something if it has a recycling symbol or number. Busted! Interestingly enough, many materials that aren’t labeled with that tiny recycling symbol are actually recyclable. A better rule of thumb is to base the recyclability on the material, not the symbol or number. If it’s a rigid plastic that doesn’t change shape if you try to squeeze it, it goes in the blue bin. As do glass bottles, jars, aluminum, and that tin foil from your latest burrito. If you’re not sure it can go in your blue bin, use RecycleWhere. Recycling doesn’t make a difference. Busted! It absolutely does! Despite the naysayers, recycling actually makes a big environmental difference. For one, it helps reduce the use of virgin resources and fossil fuels to make new products. When you put your aluminum can in the blue bin in San Francisco, in six weeks time, it’s back on the shelf as another aluminum can. This prevents the energy intensity of sourcing more aluminum to make a brand new can. Second, it helps reduce the amount of material that ends up living in our landfill for thousands of years. Why give discarded materials a death sentence when they can be recycled or repurposed and given a second life? Less material sent to landfill also means less “off-gassing” of methane, a greenhouse gas that is much more toxic than CO2. The Giants continue to lead the industry with their greening efforts and programs. True! The Giants regularly win the coveted MLB Green Glove Award, given to the team leader in recycling and general sustainability and initiatives. The Giants set industry records with their waste diversion numbers year after year, with over 90 percent of their waste being diverted from going to the landfill, an aggressive recycling and composting program. Go Giants!